BEVERLY HILLS, Calif. (AP) — The start of production on the new “Star Trek” TV series is a month away and the debut date isn’t until next January, but the effort to build fan interest is already in motion — if not at warp speed. Following up a Comic-Con panel in July about “Star Trek: Discovery,” executive producer Bryan Fuller shared details about the 13-episode series’ setting, characters and innovations at a Television Critics Association meeting Wednesday. His disclosures included that the main character is female (human, yes; a captain, no); that the story will feature a gay character, and that there will more aliens. Given that previous “Star Trek” series were all from the captain’s point of view, giving the woman different duties will allow for a new dynamic in both relationships and storytelling, Fuller said. He didn’t specify her title. The series will incorporate an event in “Star Trek” lore that’s been talked about but not explored, one which will allow for a serialized story that takes its protagonist on a journey of self-discovery. The event? Fuller wouldn’t say. There will “absolutely” be a gay character, he said. “I still have in my garage the hate mail that ‘Star Trek: Voyager’ got because of a rumor that Jeri Ryan’s character (named Seven of Nine) was going to be gay,” he said. He resolved that if he ever did another “Star Trek” series it would introduce someone who is gay. The aliens will be new and improved, and probably in greater numbers than typical for “Star Trek.” ”You usually have one person with a bumpy forehead and seven other people who look relatively normal,” Fuller said. The series will feature both newbies and the reimagining of familiar aliens — although Fuller acknowledged some Trekkies resist change. 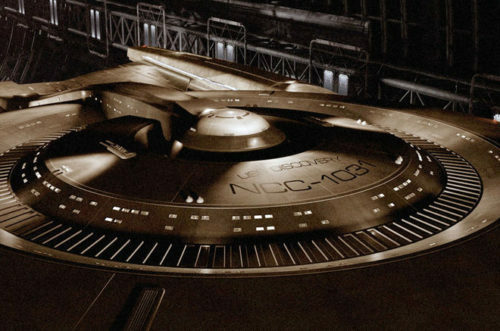 The series takes place in an era that bridges the original 1960s “Star Trek” and “Star Trek: Enterprise,” the 2001-05 series set about a century before. But “Discovery” will be much closer in time to Capt. James T. Kirk’s world, so it will be able to play with the design “iconography” of those spaceships and uniforms, Fuller said. Some potential elements include the introduction of young versions of familiar characters like Dr. McCoy, but not in season one, and perhaps the inclusion of Amanda Grayson, Spock’s mother (played by Winona Ryder on the big-screen). CBS All Access already offers episodes of previous “Star Trek” television series, along with series from CBS’ current and past broadcast schedule. The new “Star Trek” is the first original series developed specifically for U.S. audiences for the service.